The #1 Question: What Stabilizer Do I Use? – Answered! 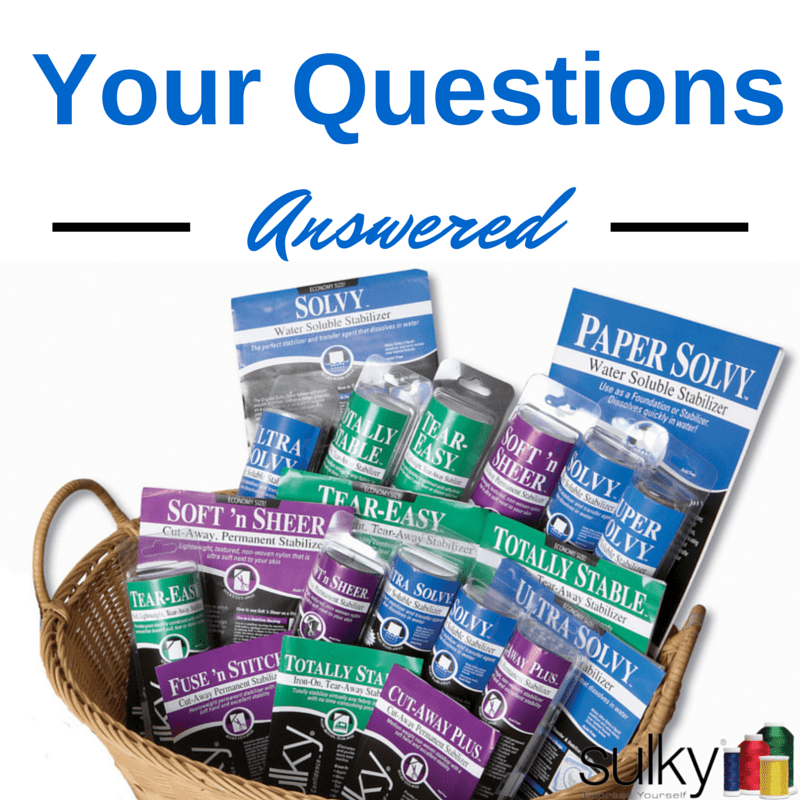 When I asked Patti Lee, Vice President of Consumer Relations for Sulky of America, what is the number one question that people ask you; without hesitation, she said, “What stabilizer do I use?” Every day, all day it seems, Patti is answering this question. 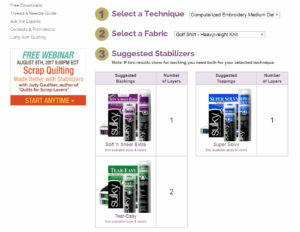 As a result, we created the new….Sulky Stabilizer Selector Tool! What stabilizer do I use seems like a pretty straightforward question, but the truth is, it’s an incredibly complicated one! 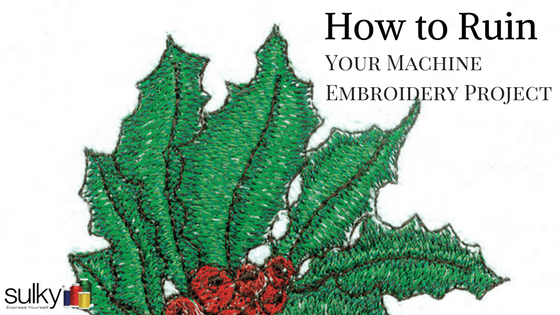 The answer depends on what type of fabric you are stitching on and the technique you are using (Applique, Hand Embroidery, Monogramming). 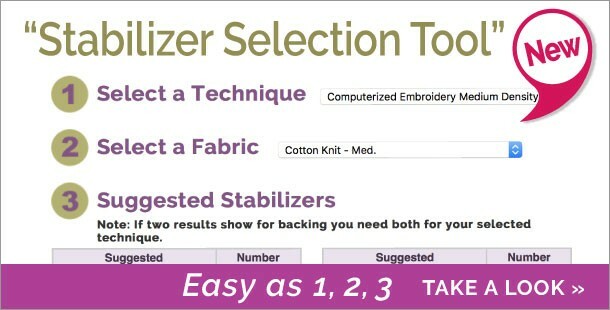 Depending on the type of fabric and the technique you are using, the Stabilizer Selector Tool on our website could give you any one of 2,278 different answers! Crazy right? This tool took our team of experts here at Sulky over a year to put together. We wanted to be sure that you are getting the best information possible so you have great results. Our motto is “Create with Confidence”, after all. First, pick a technique. There are 34 techniques to choose from. 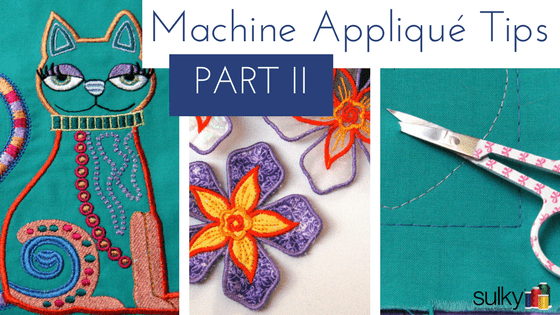 You can choose anything from Applique to Sashiko; and Monogramming to Thread Sketching. Next, pick your fabric. 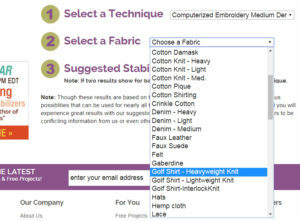 There are 69 to choose from (did you even know there were that many types of fabric? Me either!). These experts thought of it all. You can choose anything from Cashmere to Cotton, to Lightweight Knit and Hats! Once you have your combination set, the suggested stabilizer (or stabilizers, as is often the case) pops up. They are listed by which ones should be a backing stabilizer, what should be a topping, and how many layers of each you will need. 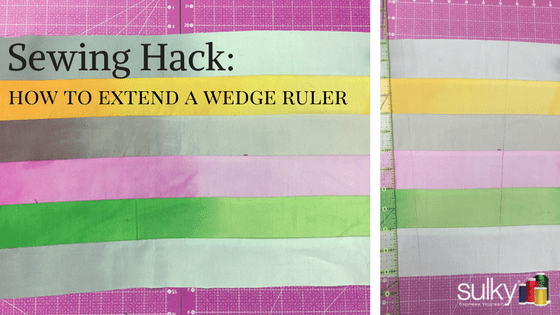 In other words, here is the fine print: Though these results are based on the suggestions of our Experts, there are numerous possibilities that can be used for nearly all techniques/fabric combinations. We are confident you will experience great results with our suggestion, so go ahead and Select With Confidence! 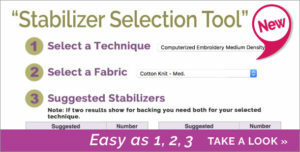 The bottom line: If you use the Stabilizer Selector Tool and follow the suggestions, we are confident you will like what you see and it is certainly a great place to start, especially if you are doing a brand new sewing technique or sewing on a fabric that you have never used before. However, we always suggest that you test before you sew :). If you want something for your actual sewing reference library on these recommendations, we have some dandies in recipe-format with pretty pictures to inspire you in this book. It’s a great reference and would make a great gift, too. 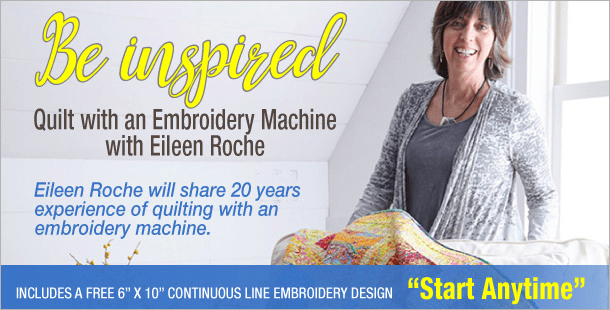 Free Webinar – Quilting with Your Embroidery Machine! This is an excellent resource since I have many of your products. I will definitely use it and recommend it to others. When this email is deleted, where can we find this tool? Wow! This is totally amazing and it’s free!!! After several years of using my embroidery machine, I feel I have a pretty good handle on what stabilizer to use, but when I’m diverting to a fabric out of my usual “box”, I need to consult my books. No more with this handy tool! Thank you so very much, Sulky! 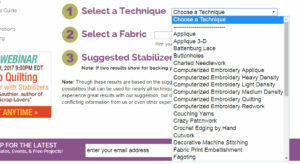 Could not find what stablizer to use when doing free standing lace. I do know that you use 1 or 2 layers of solvy or wash away. I am making baby booties from Embroidery Library.. thought the chart was great.